NEED STICKERS? NEED DECALS? NEED LABELS? You can have a few stickers printed for a quick sales kit, or take advantage of our abilities to produce in high volume, reducing your per-sticker cost. Looking for custom stickers? You’re in the right place. StickNoEvil was founded in 2010 and in October, 2017, came under new ownership. We promise to continue the tradition and passion of StickNoEvil and will continue to search for the most innovative ways to produce custom stickers to get your message across. We have helped hundreds of individuals, artists, bands, non-profits and companies order long-lasting stickers beautifully printed on quality materials. You can have a few stickers printed for a quick sales kit, or take advantage of our abilities to produce in high volume, reducing your per-sticker cost. We can also produce custom iPhone and Android skins for your company to achieve better brand recognition. All of our stickers are printed on 3 mil calendered film using 4-color CYMK solvent ink. We apply a calendered polymeric UV-protective laminate to protect the sticker from the outdoor elements. We stock matte, gloss, and polycarbonate, to insure you get exactly the finish you want. Hate surprise shipping costs? Free standard shipping is included on all sticker orders in the continental US. Need your stickers in a hurry? Upgrade to 2-Day, 3-Day, or overnight shipping for a reasonable fee. Ready to get started but still have some questions? Feel free to contact our sales team at 315-576-6377 or email us at info@sticknoevil.com. 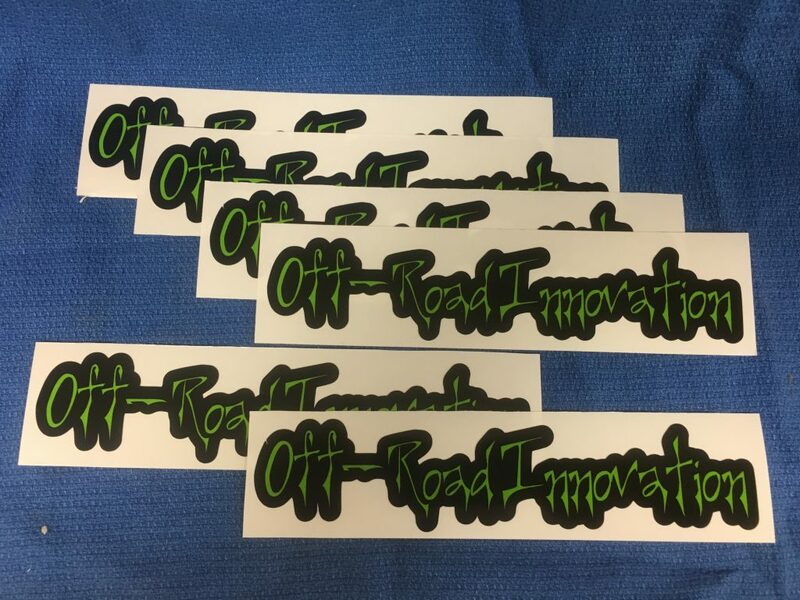 You can also check out the various products we offer: Standard Shape Stickers, Offset Cut Stickers, Contour Cut Stickers, Kiss Cut Sticker Sheets, Diecut Vinyl Stickers, and Bumper Stickers. Our stickers and decals are printed using digital 6-color solvent inkjet printers capable of creating high-resolution images. We can also provide close matches to PANTONE color space. StickNoEvil offers FREE Ground Shipping on all US orders of 50 stickers or more. Expedited services such as 3-Day, 2-Day, or Overnight are available as well. All stickers made at StickNoEvil are proudly made here in the United States. Great company with extremely fast response. Called in for an urgent order and was able to get 500 laptop stickers printed within 24 hours. The owner was very helpful and was willing to stay up later to finish the order. It helped our event a lot - if not for StickNoEvil, our participants would have left our event empty handed. Would 100% recommend this company! "...Many thanks to Frederick at Stick No Evil for the fantastic job on printing stickers! DiscMakers ferked up royally and printed the linear notes CD panel completely backwards. 🙁 Frederick printed up correction labels right away! Now I can sell my CDs and not be embarrassed by the poor production at DiscMakers. Thanks to Frederick for the write up on his blog, as well!..." "I have had sign work done on four separate occasions. SNE understood what I wanted each time, finished them in a timely manner, and the cost was very reasonable too. I am sure you will be pleased." "Working with Stick No Evil and Frederick as been seamlessly easy. We had a lot of trouble finding a company who could print sheets of such small, round stickers in smaller quantities. Stick No Evil came through for us and we are thrilled to be working with them." Absolutely love the work the guys at Stick No Evil did for me. The quality of work is excellent, and can't say enough good things about the customer service. Will definitely be a repeat customer. As a small business owner, there are certain must-haves to look for when buying supplies. Professionalism, speed, competitive pricing and the ability to guide in the right direction. I was lucky enough to be introduced to the team at Stick No Evil. They were able to quickly and efficiently guide me in the right direction for the bumper stickers I needed. Unfortunately, that's becoming rarer and rarer these days. There are 4.2 Billion reasons why our 4-Color digital printing system is better than screen printed stickers. Rounded out the week making up an assortment of large race car sponsor decals for Zappone Motors. Zappone Motors operates Chrysler Jeep Dodge RAM dealerships in Clifton Park and Granville, NY. Their customer base extends to surrounding areas including Glens Falls, Latham, and Albany. Check them out at www.zapponemotors.com. Privileged to help out the University of Rochester TEDx team! In anticipation of the 2018 conference “Making Waves” we did a rush order of 500 promotional stickers. Thanks to Head of Marketing Chester Szeen and the rest of the TEDx Executive Board!